Citizens for Health Education Foundation offers natural health consumers tools to inform the public of health issues and findings, and influence government regulators and members of Congress. We believe natural health practitioners and patrons must have a seat at the table in the national health care policy debate. For more than 20 years, the Citizens for Health Education Foundation has been a powerful voice for those who believe Americans have a fundamental right to the pursuit of natural health alternatives — choices other than ingesting Big Pharma drugs, eating genetically modified foods, and drinking fluoridated water. Partner with us and make our voice heard! Your tax deductible donation will help educate — and motivate — our fellow citizens to be aware of health choices, and the threats to curb them. The Fluoride Deception documents a powerful connection between big corporations, the U.S. military, and the historic reassurances of fluoride safety provided by the nation’s public health establishment. 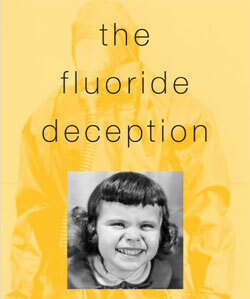 The Fluoride Deception reads like a thriller, but one supported by two hundred pages of source notes, years of investigative reporting, scores of scientist interviews, and archival research in places such as the newly opened files of the Manhattan Project and the Atomic Energy Commission. The book is nothing less than an exhumation of one of the great secret narratives of the industrial era: how a grim workplace poison and the most damaging environmental pollutant of the cold war was added to our drinking water and toothpaste. Purchases support the Citizens For Health Education Foundation. Distributing our research papers — sending them to friends, the media, and your Washington representatives — is ultimately our unique role for consumers and practitioners of natural health care. Thanks to you, we are building a powerful and informed constituency that takes action to protect access to natural heath care and living. Stay involved and invest in the Foundation with a tax-deductible donation.